450 pages | 9 B/W Illus. The current focus on sustainable development opens up debates surrounding our relationship with the natural world, about what constitutes social progress and about the character of development, both in the Global North and the Global South. The promotion of sustainable futures is taking on a new urgency in the context of climate change and biodiversity loss. This concise and accessible text explores how the international community is responding to the challenge of sustainable development. It also investigates the prospect for, and barriers to, the promotion of sustainable development in high-consumption societies of the industrialised world, from the USA and the EU to the economies of transition in Eastern and Southern Asia. In Sustainable Development Baker considers the global impact of China’s industrial boom as well as how Chinese investments are shaping the prospects for sustainable development on the African continent. This global coverage is balanced by investigating how local action, ranging from the transition towns movement in the UK to the Green Belt movement in Kenya, can contribute to the pursuit of sustainable development. 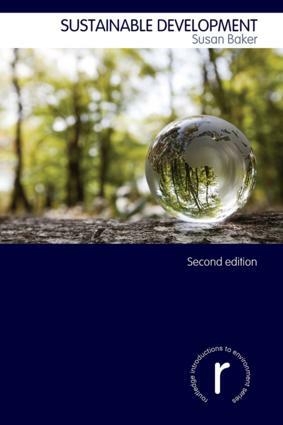 The second edition has been extensively revised and updated and benefits from the addition of three new chapters: sustainable development in China; the governance of sustainable development; and sustainable production and consumption. Climate change and biodiversity management have also been expanded into full chapters. Providing an up-to-date and comprehensive treatment of the issues surrounding the promotion of sustainable development, this unique, internationally-focused book combines a strong conceptual analysis with wide ranging empirical focus and a wealth of case material. Including summary points and suggestions for further reading, as well as web resources and an extensive bibliography, it is ideal for students, scholars and researchers in the fields of environmental sciences, politics, geography, sociology and development studies. "The second edition brings scholarly and pedagogic clarity to the complex and contested problematique of sustainable development. Baker offers a analysis of the origins, dynamics, actors, governance dimensions, policy implications and theoretical debates around this concept which as she points out is and will continue to shape local and global politics in the 21st-century. It is written in an accessible and student-friendly style, in three parts covering theoretical/conceptual aspects of sustainable development; multi-level governance, including the international politics of sustainable development; and finally the promotion of sustainable development in the EU, eastern Europe and the global south. Baker's Sustainable Development will be the benchmark textbook on undergraduate courses for many years to come". For those seeking a clear, comprehensive and accessible introduction to sustainable development, look no further. Susan Baker’s second edition of Sustainable Development covers all the important topics and debates from a truly global perspective. It should be essential reading for anyone wishing to understand the greatest challenge of our time. In this systematic, easy-to-read and comprehensive book, Susan Baker scrutinizes the concept of sustainable development and its implementation around the world across different economic sectors. The second edition of this popular book provides both students and researchers with in-depth insights into the multi-level challenges involved. lively global case-studies boxed throughout the text.